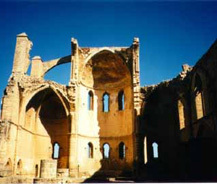 St. George of the Greeks was used to be the magnificent Orthodox cathedral of Famagusta. It was built in 15th century by Byzantines. The cathedral has been devoted to St. Epiphanios who has been buried there before it has been taken to the Constantinople. It has not been restored for a long time, and in 1571, the Ottoman army has damaged much of the building. Certain parts of the building has been blown off. Natural disasters have occurred in 18th century- two impetuous earthquakes have damaged the remains aswell. Today, there are ruins of St. George of the Greeks with some antique wall paintings and a nice historical story.